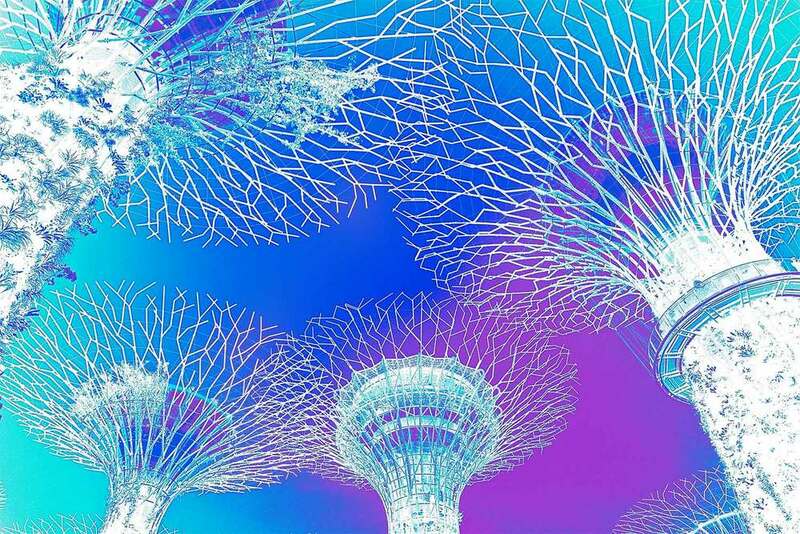 How absolutely amazing are the Supertrees at Gardens by the Bay! Whether you visit by day or night, the Supertrees never fail to inspire and bring out the kid who sees a superstructure and immediately wants to climb it and discover a world of wonders hidden in the branches. My family and I love lying down on the grass under the Supertrees and stare up at the trunks covered in lush vegetation and spiky branches that splay out overhead in striking patterns. During the day you can make your way up to the viewing decks and take on the skyline views of Singapore laid out across the river, and by night the trees burst to life with a dazzling display of lights and music. The photos in the Supertrees collection capture silhouettes of the branches of the Supertrees taken from below, and make use of vibrant background tones that add a real sense of energy and life to the images.